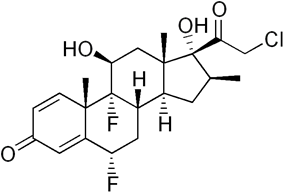 Ulobetasol (INN) or halobetasol (USAN) is a corticosteroid used to treat psoriasis. It is a group I corticosteroid under the US classification, the most potent class of such drugs. Halobetasol propionate is usually supplied as a 0.05% topical cream. See instead (modulators of 20,22-desmolase, 17α-hydroxylase/17,20-lyase, 3β-HSD, 11β-HSD, 21-hydroxylase, 11β-hydroxylase, and 18-hydroxylase).